Yogurt is a delicious, protein rich, multi-vitamins packed food that has been used for centuries as the best remedy for various health and beauty problems. Being a powerful natural storehouse of various vitamins and minerals yogurt is used to cure many problems regarding digestion, immunity, skin and hair. When topically applied to the skin and hair yogurt also has wide-ranging benefits. Besides this, yogurt also plays an important role in healthy growth of strong bones and teeth. Let's have a look on some best health and beauty benefits of yogurt. Yogurt is rich in Vitamin B2 (Riboflavin), Vitamin B5(Pantothenic Acid) and Vitamin B12. Riboflavin(Vitamin B2) is necessary for cell growth and regeneration and also protects skin cells from oxidative damage by free radicals. Pantothenic Acid (Vitamin B5) has a major role in the metabolism process that converts carbohydrates, fats and proteins into energy. Yogurt also contains B12, which maintains the level of red blood cells and helps keep your nervous system functioning properly. Yogurt helps a lot to boost your immune system. According to recent studies eating yogurt with probiotics can increase the amount of T lymphocytes, the white blood cells responsible for fighting off infections. Sugar free and Plain Yogurt can reduce the levels of hydrogen sulfide in the mouth and bacteria on the tongue that contribute to bad breath. Sugar Free Yogurt Yogurt may also reduce plaque buildup and prevent cavities and gingivitis. Yogurt contains a good amount of calcium which is essential to build up healthy bones. Besides this, yogurt also contains a good amount of lactoferrin, an iron-binding protein that stimulates growth of cells that build bones and reduces or prevents the onset of osteoporosis. Additionally plain and sugar free yogurt is also important to maintain healthy teeth growth and prevents early tooth decay. Yogurt improves digestion and helps a lot to many problems related digestive system. Probiotics in yogurt help keep the balance of bacteria in our gut, they have the ability to keep the digestive track in order and calm various digestive problems such as diarrhea, gas, cramps and even irritable bowel syndrome. Yogurt contains lactobacteria, intestines-friendly bacterial cultures that improve the growth of a healthy colon, and even lower the risk of colon cancer. Lactobacteria, especially acidophilus, promotes the growth of healthy bacteria in the colon and reduces the conversion of bile into carcinogenic bile acids. Besides this, yogurt is a rich source of calcium that contributes to colon health and decreases the risk of colon cancer. Yogurt helps a lot to cure the problem of erectile dysfunction and sexual impotence in men. For best results consume 1 bowel of low fat and sugar free yogurt on an empty stomach. Recent Scientific studies have proved that fat free plain yogurt reduce abdominal fat and promote weight loss. Additionally, yogurt contains calcium, and calcium-rich foods have been shown to help burn fat. Hence adding yogurt in your daily diet plan helps a lot to weight loss. 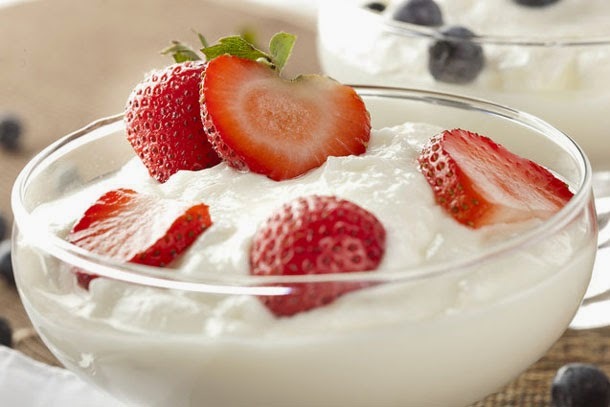 To enhance the Fat burning effect of yogurt you can add some berries in plain yogurt and have the on an empty stomach. Heal sunburns naturally with yogurt. Yogurt contains zinc that helps provide relief from the burning and itching sensation that sunburns provide. To cure this problem make a mixture by mixing 1 tablespoon of yogurt and adding some chamomile essential oil. Rub the paste over the sunburn area and leave at least for 15-20 minutes and then rinse off. Yogurt helps a lot to fight against various skin infections. Fungal infections on the skin can be cured by applying a small amount of yogurt on the affected area. For best results repeat this twice a day. Yogurt is considered very effective to lighten dark skin. Besides skin lightening, yogurt is also very helpful in reducing the appearance of skin blemishes, moles and freckles. Take 1 tablespoon of yogurt and add half teaspoon of lemon juice. Apply this mixture to your face and then rinse off after 15 minutes. Yogurt is acidic in nature and helps a lot to destroy the various acne-causing bacteria and germs. To enhance the effect of yogurt you can add some turmeric powder and apply this mixture to acne at least for 15 minutes and then rinse off. For sun tanned dark skin, take 1 tablespoon of plain yogurt and mix with 1 tablespoon of dried orange peel powder and apply this mixture on affected areas at least for 15 minutes and then rinse off with lukewarm water. For naturally soft and fair skin, take 1 tablespoon of yogurt and mix with 1/2 teaspoon of turmeric powder and half teaspoon of rose water. Massage your face with this mix for 15 minutes and then wash off with lukewarm water. You will get softer and fairer skin right after the application. To shrink and tighten large pores on skin, you can gently apply a tablespoon of plain yogurt on your face. Wait for about 15-20 minutes to let it get absorbed and then rinse off with cool water. Yogurt helps a lot to cure dandruff and itchy scalp because yogurt contains anti-fungal and anti-bacterial properties that help stimulate hair growth by acting as a natural cleanser and helps in getting rid of dandruff from the hair and scalp. The anti-bacterial benefits of yogurt for hair also help soothe the scalp and reduce itchiness. To remove dandruff massage yogurt into the scalp and then leave for 15 minutes and then wash off with fresh water. The lactic acid properties help moisturize the scalp and exfoliate dead skin cells, thus curing dandruff and soothe the itchy scalp. Yogurt is also very helpful in treating hair split ends and naturally reduces hair fall. To treat the problem of hair split ends, take half cup of yogurt and mix with equal amount of mashed papaya pulp. Mix them well and apply the mixture on the hair and then leave for 30-40 minutes and finally wash off with fresh water and a mild shampoo. To cure the problem of hair fall, make a paste of yogurt and some ground fenugreek seeds. Apply it on the scalp and leave it on for 30 minutes and then wash off with regular mild shampoo. Yogurt is an excellent conditioner for your hair. Simply apply yogurt on your hair for 30-45 minutes and then wash off wash off with fresh water and experience softer and glossy hair within minutes. To enhance the effect of yogurt you can add 2 eggs and 1/2 teaspoon of olive oil in half cup of yogurt. Mix them well and apply this mixture to your hair at least for half an hour and bring natural shine and volume to your hair. Yogurt lock in the natural moisture in your skin from washing your face and revive your dull and dry skin. A simple yogurt facial applied two or three times a week will leave you with soft and supple skin. Yogurt contains lactic acid, an alpha hydroxy acid that helps to smooth rough, dry skin and prevent premature aging such as fine lines, wrinkles and age spots. Lactic acid helps to dissolve dead skin that accumulates in the pores, causing a dull and rough appearance. Besides this, yogurt aids in shrinking large pores, making skin soft, smooth and look younger. Yogurt has excellent anti-aging properties that help fight against skin damaging free radicals. These free radicals damage skin cells by stripping off oxygen molecules from them. They also cause fine lines and wrinkles to appear on skin. To prevent and cure premature wrinkles and keep the skin youthful and glowing, make a face pack by mixing 3 tablespoons of yogurt with 1 tablespoon of olive oil. Apply this mixture on the face for 30 minutes and then rinse off. For best results repeat this at least 3 times a week. The protein you get from eating yogurt helps skin become firmer and prevents the formation of premature fine lines and wrinkles. Greek yogurt is especially beneficial because the protein content is often double that of regular yogurt. Eat a single serving daily to make your complexion smoother and apply plain sugar free yoghurt to calm irritated, dry, or sensitive skin. Additionally yogurt also reduce the size of large facial open skin pores and makes skin more firmer and tight. A mixture of grated cucumber and yogurt is also very helpful in skin firming and tightening. Apply the mixture generously over the face and let it dry for 15 minutes before rinsing with cold water. Cucumber provides a cooling effect that helps tighten facial pores while yogurt provides a firming action. Yogurt is very helpful in preventing premature aging because Yogurt effectively fights off skin damaging free radicals and contains anti-aging properties that delays appearance of premature fine lines and wrinkles. The lactic acid in yogurt helps prevent premature skin aging. Additionally lactic acid in yogurt also helps dissolve dead skin and tighten skin pores. You can make an anti aging yogurt mask by mixing 1 tablespoon of yogurt with 1/2 teaspoon Vitamin E oil. Apply this mixture to your face at least for 15 minutes and then rinse off with fresh water.